Home > Featured > Peru, here we come! 11 Apr Peru, here we come! 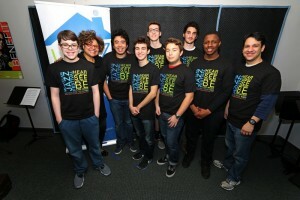 Seven talented New Jersey high school musicians will once again act as unofficial ambassadors of jazz when students of the award-winning Jazz House Big Band head to Peru on April 11 for a nine-day trip of performances, masterclasses, jam sessions and sightseeing. Sponsored and supported by the United States Embassy in Peru and the Instituto Cultural Peruano Norteamericano (ICPNA), this is the second annual Peruvian cultural exchange for Jazz House Kids, a New Jersey-based nonprofit that has gained a reputation as one of United States’ preeminent arts education and performance organizations. Accompanying the students will be Jazz House Kids president and founder, vocalist Melissa Walker, along with trumpeter and Jazz House Summer Workshop director Ted Chubb, and pianist and teaching artist Oscar Perez. Walker and Chubb will perform with the students, and Perez will direct the ensemble. The Embassy will host the group on April 17th at a special “Earth Month” concert in Manchay, with opening remarks from U.S. Ambassador to Peru, Brian A. Nichols. The Manchay performance will include joint performances with Peruvian students. Jazz House Kids students will open the 16th annual weeklong Jazz Festival in Lima, which features musicians from around the world. Other tour highlights will include jazz masterclasses at the National Conservatory, and concerts at Peruvian clubs, schools and cultural centers. The group also will travel to Iquitos, the largest metropolis the Peruvian Amazon, and the sixth most populous city of Peru. There, they will conduct a masterclass for local students and perform a free, evening community concert.